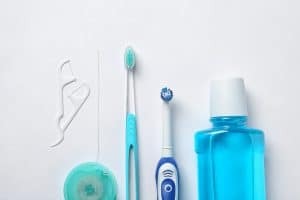 How well do you plan your dental hygiene routine every day? If you’re like most people, you’ve brushed and flossed and rinse your teeth so often that it barely takes any conscious thought, much less any planning. However, that familiarity is one reason why many people’s hygiene routines are lacking in one area or another, leading to the frequent development of preventable issues like tooth decay, gum disease, and more. Fortunately, there are many different highly customizable treatment options available to address such issues, though with a few tweaks to your hygiene routine, you’ll have a better chance at avoiding them altogether. The basics of dental hygiene – brushing and flossing your teeth – have one main goal; to consistently remove the harmful oral bacteria and food particles that form plaque on your teeth every day. Plaque has a specific purpose, as well; to protect harmful bacteria as they feed on those food particles and convert them into substances that are harmful to your teeth and gums. Keeping your teeth and gum line free of oral bacteria is the most effective way to stop the microbes from growing strong enough to threaten your smile. If your routine is lacking, then you can’t effectively keep your teeth as clean as they need to be to remain healthy. Don’t just brush and floss every day; brush your teeth at least twice, and preferably, floss right before bed time. Oral bacteria are highly active throughout the day, but they’re even more so when you sleep at night and your saliva dries up. Also, be careful not to overfeed oral bacteria by snacking frequently throughout the day. They attack your teeth and gums by metabolizing nutrients like sugar, carbs, and certain proteins, converting them into harmful acids and toxins. Address any existing dental issues as soon as possible. For instance, if your teeth are crooked, then keeping them clean will be more difficult. Straightening them will not only improve your smile, but also your ability to prevent excessive plaque buildup. Ask your dentist about adding anti-bacterial mouth rinse to your routine. Rinsing your mouth with the solution can help remove harmful bacteria from areas of your mouth where your toothbrush and floss can’t reach, improving your preventive efforts. Use the rinse (or water, if necessary) to rinse your mouth after each meal and snack. If you don’t have a toothbrush handy, then rinsing your mouth will help wash away bacteria and prevent food particles from lingering around to feed the rest. Dental hygiene is second-nature to most people, but that doesn’t mean your routine can’t benefit from a few improvements. For more information, schedule a consultation by calling Syosset Dental in Syosset, NY today at 516-433-2211 or 516-921-6930.